Earlier today, a car driving southbound on Route 12 near the Route 9 East exit crossed the center line and crashed head on into a fuel tanker truck that was loaded with nearly 4,000 gallons of fuel. The tanker came to a stop just south of the Route 9 overpass, and the cab caught on fire. Unfortunately, the two occupants of the car died immediately upon impact, but the driver of the fuel truck managed to escape with minor injuries. I was at work in the Colony Mill building on West Street when the accident occurred. I saw nearly every emergency vehicle on the Eastern side of Keene racing West on West Street with a sense of urgency like I have never seen before. Shortly after hearing the first wave of sirens, I could see heavy black smoke rising above the Ashuelot River park to the Northwest of my office. Because of the severity of the accident, local officials closed Route 9 between Washington Street and the junction of Route 12 where the accident occurred. They also closed Route 12 between Maple Avenue and West Street. Though the accident occurred in the morning, they were still working on the investigation and cleanup as I left the office a little after 4pm. I later learned that a significant amount of fuel had spilled in the accident, and the burning truck cab ignited a small brush fire and damaged powerlines that were intersecting the highway. My route home runs parallel to the stretch of Route 9 that was closed after the accident and I noticed that the normally busy highway was completely silent, an eerie reminder of what had occurred earlier in the day. 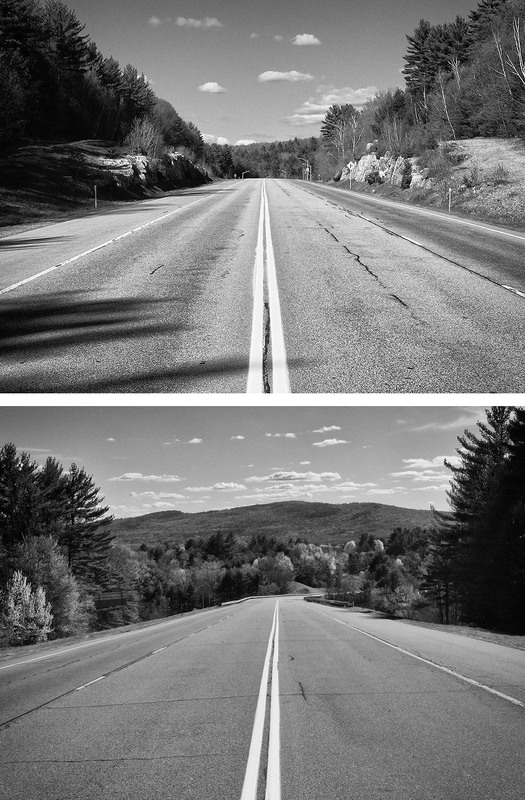 I decided to cut through the woods over to the highway, and stood in the middle to take two photos of the deserted stretch of road, one facing East and the other facing West.